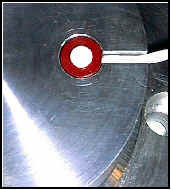 Piezoelectric In Die Parts Monitoring creates the ability to produce and maintain high quality production parts, by mounting in the dies Satellite transducers. Ideal for progressive dies, transfer tooling and multi-station forming operations. Easy to install using our unique In Die KISS Kit supplied with each Satellite consisting of a 3/8”- 24 X 3/8” long Flat Point Set Screw (M10 X10 MM) and a 3/8”- 24 X 3/16” long Locking Ring (M10 X 5 MM) equipped with a milled mounting hole for a precise transducer fit and designed to accommodate a torque wrench to pre-stress the 112 IDS to 15 inch lbs. which accurately sets it after installation. A Piezoelectric transducer creates its own natural self-generating signal which is 50,000 times greater than a strain gauge transducer signal. 100% of the load signal is valid “load” signal not influenced by electrical “spiking” noise disturbances which could be seen if using strain gauge type transducers due to the necessity to amplify their signal. What you see is what you get! The signal level coming from the Satellite In Die transducer is showing you exactly what is occurring in the dies. This pure signal level allows the In Die Satellite Transducer to monitor and detect minute changes in the forming process that effect the quality of the parts being produced. 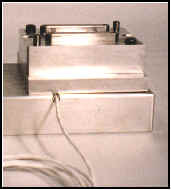 This technological edge gives the piezoelectric Satellite In Die transducer the natural advantage to perform superior Absolute Part Monitoring by identifying a part that has not met the predetermined quality standards or to maintain quality parameters needed to produce a repeatable, acceptable part. 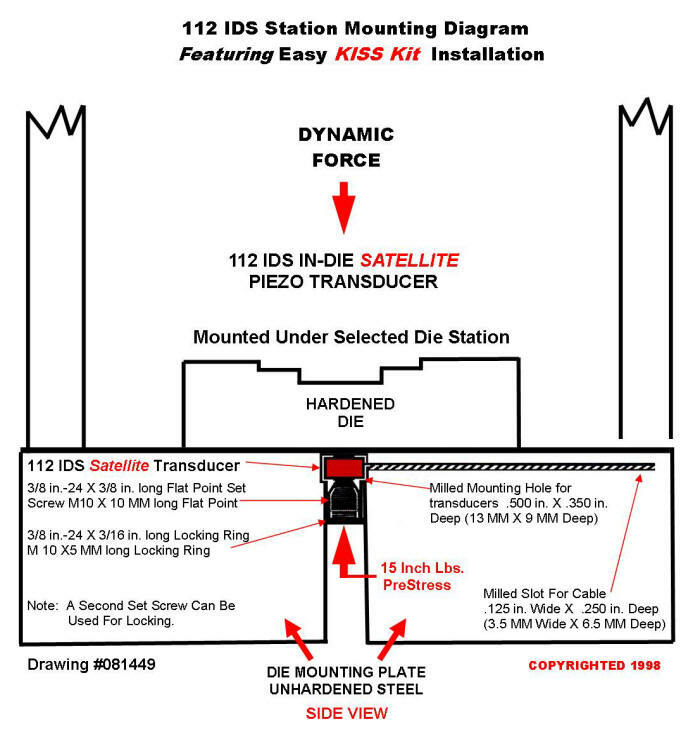 The 112 IDS IMCO In-Die Satellite Piezoelectric transducers are mounted in the hardened die plate under a section of die that has a critical load to be monitored. Multiple 112 IDS transducers may be connected in parallel to increase signal strength and average the load from a wider area in the die. 112 IDS transducers are wired for compression with Teflon cable, which is impervious to oil and maintains its flexibility. 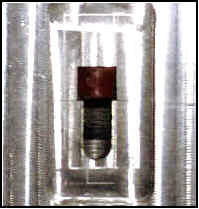 Due to its small size the 112 IDS does not compromise the integrity of the die plate in which it is mounted. The 112 IDS Transducers can be used with any type of IMCO Load Monitoring Systems. Proforce is ideally suited to be used with 112 IDS transducers. Each Proforce I/O Module can be used with the 112 IDS to monitor one die station. You can add an unlimited number of Proforce depending on your requirements for monitoring. Proforce I/O Module is ideally suited to be used with 112 IDS transducers. Each Proforce I/O Module can be used with the 112 IDS to monitor one die station. You can add an unlimited number of Proforce depending on your requirements for monitoring. Click on PROFORCE I/O/ MODULE to find out more!